2-23-2017 – 6:21 AM – Good morning from Mammoth Mountain, we have clear skies that will give way to pt cloudy skies with scattered snow showers today. Expect highs in the teens with lows near 0 tonight, winds will be out of the west 15-30 MPH with gusts to 40 MPH possible today. Snow conditions for today will be fresh deep powder off the top and chairs 9 and 14. There is still some fresh on the face of 5. The rest of the hill off the groomers got tracked out on Wednesday. The groomers have all been taken care of, they will offer up some nice fresh packed powder snow today. To get a better visual idea of what it’s like out on the hill Snowman is headed out at 8:30 today to get a fresh photo snow report. We will have that posted here by 5pm today. Up on the hill the base at Main is at the 210 inch mark, with over 350 inches over the top of the mountain. This is the deepest base for this date in time since the ski area began keeping records. Looking at the weather for the weekend we should have cloudy skies develop on Saturday leading to a chance of snow showers and a trace of snow. Saturday night into Sunday we look to pick up 6-10 inches of snow from Main Lodge to the top of the mountain. 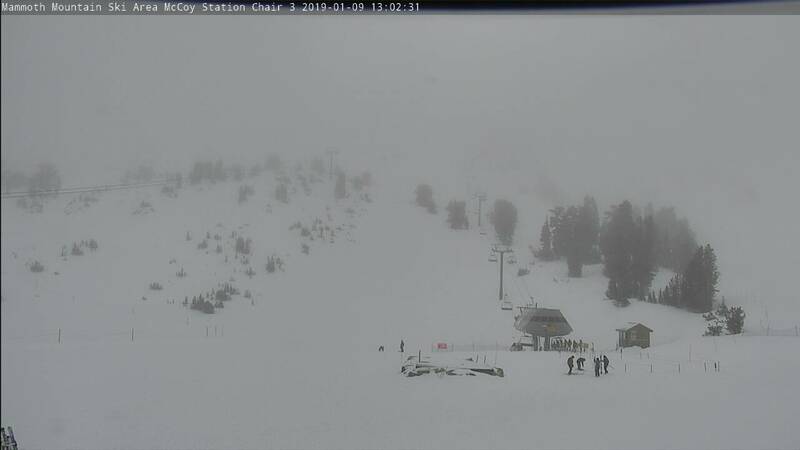 The long range outlook shows clear skies after that right into March 10th and beyond now, so Mammoth will get a big break and lot’s of snow bluebird days to enjoy. It will be time to break out the sunscreen.